Soochna Seva Kendra Pidhari centre was inaugurated on September 3, 2016 and since then Satyaprakash Ram is looking after the centre operations. Shri. Ramchandra Shah (Cellular Number 09572614690), a Pidhari resident was curious about the centre’s core functionality. He paid a visit to the centre and asked Satyaprakash about the centre’s activity. He was glad that centre is providing Digital Services and Digital Literacy to help villagers in facilitating GES and also assist in resolving the community-based conflicts. On September 16, 2016 he came back with fellow villagers and reported that many community residents are struggling to get their children medical check-up done through Aaganwadi and seek Soochna Seva help in this regard. Satyprakash, assured the villagers of his full support. He approached Dr. Ajit Kumar who attends patient at Govt. Hospital Mainatand and briefed him about the situation. On October 3, 2016 Dr. Ajit Kumar called Satya Prakash and informed him about his plans to visit and asked Satyaprakash to accompany him as his assistant. 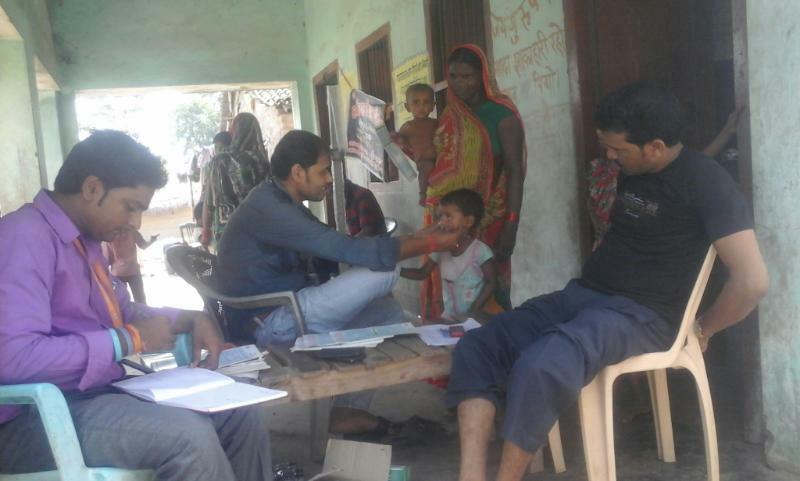 Dr. Ajit Kumar on his visit to Anganwadi Kendra (Kendra No 51) did medical check-up of 55 children.